Eosinophilic esophagitis (EoE) is a chronic inflammatory disorder of children and adults. The disease is defined by clinicopathologic criteria, including symptoms of dysphagia and food impaction, esophageal biopsies with ≥15 eosinophils per high powered field and lack of response to antisecretory therapy. Patients with eosinophilic esophagitis have a wide variety of endoscopic findings and the disease does not have a uniform endoscopic appearance. 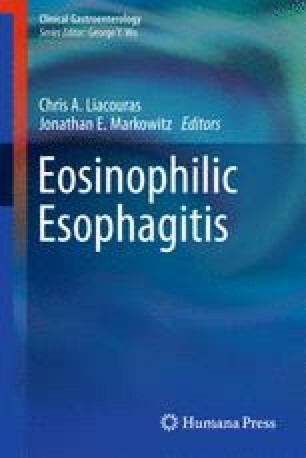 In fact, one study suggested that only 38% of individuals thought to have eosinophilic esophagitis at the time of endoscopy had histologic confirmation of the disease and a subset of patients may also have an entirely normal appearing esophagus! Furthermore, endoscopic findings may vary by age. Endoscopy plays a key role in the diagnosis of EoE patients and the varied endoscopic features of this disease are the focus of this chapter.